Every sentence draws blood (2012). Photographic documentation of public performance with found text, tattoo & water. Kassel, Germany, 7 September 2012. For this work I collaborated with the tattoo studio Villa Dunkelbunt (Kassel, Germany) to redesign and write Decio Pignatari’s seminal concrete poem ‘Beba Coca Cola’ (1957) upon my arms. The text was tattooed with water momentarily producing an excess of blood although the tattoo will eventually disappear. The title serves to remind of the manner in which tattoos may be said to ‘write bodies into’ various institutions and communities such as prisons, to name an obvious, though rather negative example. However, the elaborate design of the tattoo, including creative elements of pattern and decoration, signal an element of pleasure found in the material meaning making process and forms of artistic expression. The work seeks to highlight the material capacity of bodies to heal and ultimately to resist the excessive power of ideology and discourse (where the latter is understood as being somehow independent from the material body). The work was presented as part of the European Artistic and Research Network’ s (EARN) participation at Documenta 13 (thus neatly mirroring the 13 word form of Pignatari’s original poem). 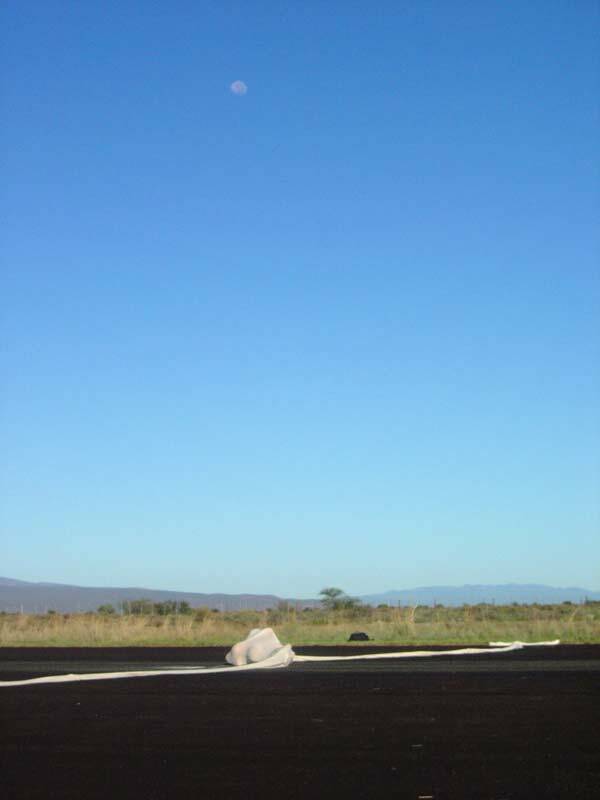 Images credits: A. Fourie (Top) D. Thom (Bottom). Compilation of video stills. C-Type print on aluminum, 40cm x 15cm. Edition of 5, artist proof. Production still of public performance at lake with burning Oxford Hindi-English Dictionary, Patna, India. Performance held as part of “Rites of fealty/ Rites of passage” a group exhibition curated by Johan Thom & Bronwyn Lace and held at the Bag Factory Art Gallery, Johannesburg 29 July 2008. A single figure wearing white pants, with his hands on his lap. A large steel bucket full of milk is postioned on a mirror base in front of him. The female figure is dressed in white and stands one step behind the figure on the base. Her hands are placed on her lap and she wears an apron. Two silver steel containers are placed on the floor beside her. These containers are filled with honey and blood (and mixed materials) respectively – she kneels, bending one knee and lowers her hands into the the materials. She straightens up and takes one step forward, covering the head of the first figure in a thick layer. She begins by placing both hands on the crown of his head, taking care to keep the materials separated. Then she lowers both hands until she reaches his shoulders in a smooth affectionate gesture. She pauses momentarily when she reaches his shoulders and as she releases her hands from his body she takes a step back placing both her hands directly underneath her breasts (she will clean the excess of materials by rubbing her hands downward on the apron whilst the male figure completes his action). Repeat the action until the materials are finished. Using his hands to stabilize his body, the kneeling figure now lowers his head and torso into the milk – keeping it there until he runs out of breath. Once complete he raises his body placing both hands on his lap again (neatly mirroring the basic gesture & posture of the female figure). 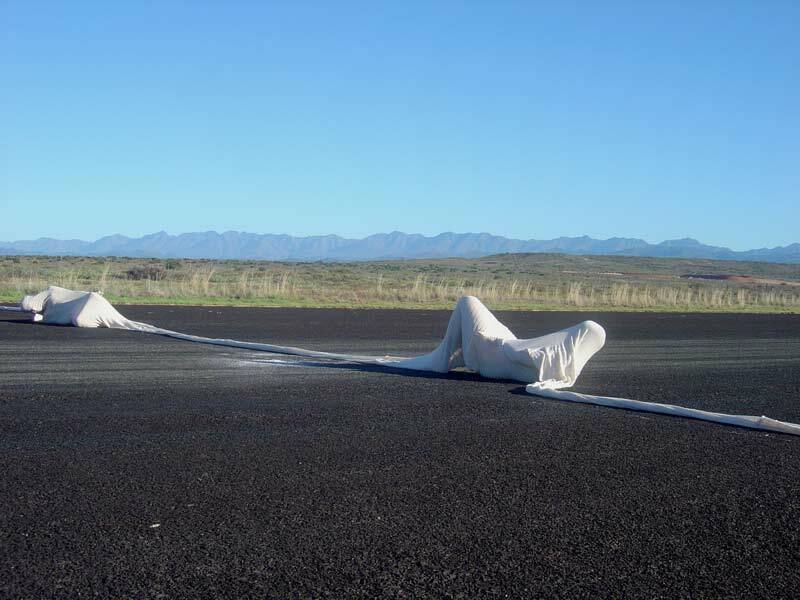 A public performance commissioned for ‘Diens’ a group exhibition curated by Liza Grobler and held as part of the Klein Karoo National Arts Festival 2004, Oudsthoorn, South Africa. 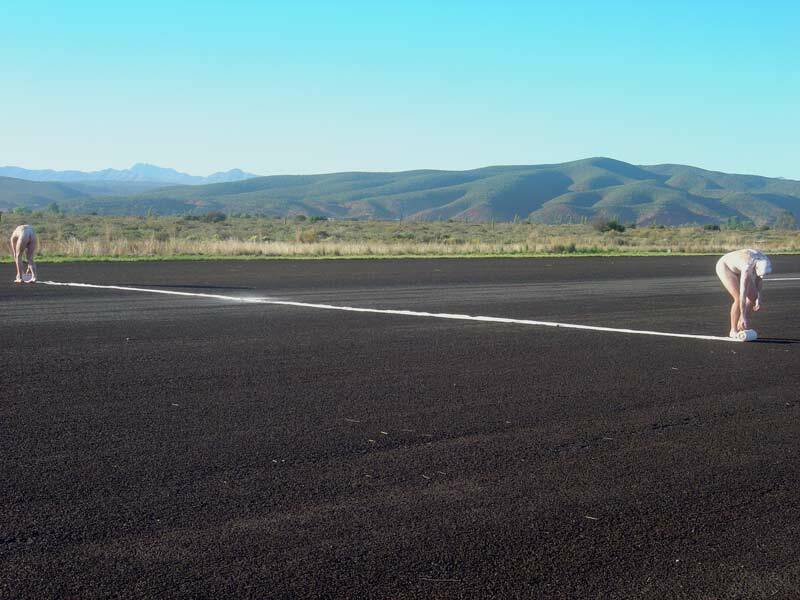 This performance took place on a small airfield outside Oudtshoorn. O’Flynn and I crawled through a 50meter piece of muslin cloth, struggling to find our way in order to pass each other and to emerge on opposite sides. The work took approximately 45minutes to complete. Both O’Flynn and I had our particular conceptual reasons for doing the piece – we call it a collaboration but in actual fact we only collaborated in deciding the formal aspects of the work. A private performance commissioned DI.E.N.S., a group exhibition curated by Lise Grobler and held at the Klein Karoo National Arts Festival, 2004, Oudtshoorn, South Africa. The artist towed a pickup truck/ ldv on a deserted dust road outside Oudsthoorn – dragging behind it a pile of rubbish (branches, plastic, rope – a disfigured effigy of sorts). At the time there was extensive media coverage of a criminal case where his employers and his fellow workers had dragged a farm worker to death behind a pickup truck. Sadly this was not an isolated incident – farm killings of both workers and their employers are commonplace in South Africa. It is also a known fact that a pickup truck or ‘bakkie’ as its commonly known in South Africa, is one of the most dangerous vehicles to own in SA as they are often violently hijacked and/or stolen. This brings to question what kind of contemporary mythology these vehicles could be said to embody – that of the “boer” (the white farmer, the racist, the capitalist, the landowner); of land (the ownership of land and of contemporary land reform or the lack thereof); of crime (hijackings, theft); of trade (the vehicle is after all a utility vehicle designed to transport large quantities of materials and goods); of the gung-ho South African city slicker who so desperately wants to seem in control of his surroundings? Pickup trucks are simultaneously detestable – and – desirable objects. Medium: Performance held on 16 November 2003 at “outlet”, Pretoria. During the performance the viewer could only witness the actions secondhand: a black and white projection, as well as a sound system that had been installed underneath the floor of the space where the performance took place, was placed inside a large hall from where the viewers witnessed the event. Only after the performance had been completed were viewers allowed into the performance space. The projection gave the impression that my movements were free from all spatial constraints. On entering the room where the performance took place the viewer was confronted by the reality of the space (and of the artists experience): the vivid red of the perspective lines which he had drawn with his own blood and the reality of the various spatial devices and objects employed to achieve the illusion of free movement were laid bare. In turn, the viewer’s experience of the event was shown as being fragmented, multiple and even contradictory. “For me, the work is a metaphor for my attempts at redefining the world anew through the continuous (re)mapping of our multiple histories and futures – a bittersweet process that can only begin with the acknowledgment of the width and the breadth of all lived experience as the fountainhead from which our knowledge of history, and our dreams for the future, will be mapped”.